I have bought Cross Core 180. Every year I go to the Australian Health and Fitness Expo Darling Harbour Sydney and I usually buy something that is rubbish. I get it home and then use it with my clients, and it just either dangerous, or plain useless like the medicine ball on a rope….. This year I have bought Cross Core 180, for about $285, and it is fantastic. It is much like the TRX system but it is not fixed. I found the TRX system really expensive for just a few pieces of webbing. 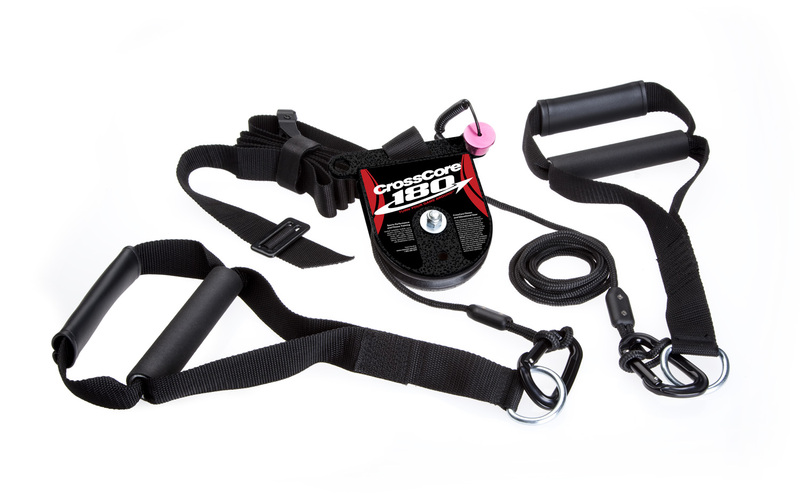 The Cross Core 180, has a moving cable with carabiners and tow handles. So it works like a pulley system, with either using your own body weight or you can attach one of my other best Expo buys a kettle bell to the handles. The cable is not fixed. The cable moves so you can have a more dynamic strength workout. I will use this to improve my own and my clients core stability by performing compound functional exercises. Exercises that work well on the Cross Core 180 are Hamstring Curls, Single Leg Hamstring Curl, Hamstring Flutter Kick, Chest Press to a Full Rotational Chest Press, Lat Rows, Pull Ups, Knee Raises, Suspended Crunch, Single Leg Squat, Single Leg Lunge to name my favourites. It is great for Hypertension clients. I can keep their head above their heart for most of the Cross Core 180 exercises, and the exercises can be preformed unilaterally. I’m an outdoor trainer so I suspended the Cross Core 180 over a tree branch. I tested my body weight on the handles before I used the product to make sure the branch and the webbing was going to take my body weight to be safe. You can hang it in a solid core door frame too. A kids swing set will also do the trick. Again always test that it will hold your weight before performing any exercises. There is a “Lock and Load” system on the pulley housing. A magnetic pin can be locked into position to prevent the cable from moving freely for when you are starting a new exercise. It can then be removed to make the exercise harder with more range of motion. It came with it’s own carry bag and only weight 1.9 kilos. The DVD was helpful to watch and it comes with a instruction manual with basic training exercises to match the exercises on the DVD. The length of the rope can be shortened by using a Lanyard Hitch knot then clipping it through the carabiners. Some of the exercises require a different length rope and your or your clients height may vary so it can be easily adjusted. The Cross Core 180 is a simple devise and it just works. If you are an outdoor trainer like me you will be happy to carry the extra 1.9 kilos in your back pack to get this diverse work out for yourself or your clients. This work out won’t burn heaps of calories (that’s what running is for) but it will make you stronger in a functional way. I was wearing a heart rate monitor and I barely got my heart above 80 beats per minute. It switches on all your stabilising muscles and it can target hard to reach areas like your hamstrings. I found the Flutter Kick exercise extremely beneficial for strengthening your hamstrings. This exercise can usually only be preformed in a pool with a kick board. So the Cross Core 180 definitely has a place in my sessions for injury prevention and to perform functional compound exercises for all my clients.